It's almost a perfect fit. Since before Netflix surprise-released The Cloverfield Paradox on the night of the Super Bowl, fans have been speculating that John Krasinski’s silent apocalyptic horror A Quiet Place might also share the same cinematic universe. It might seem crazy that we’d get two Cloverfield trailers on the same night and two films released within two months of each other, but this theory does actually carry some weight. There’s even some behind-the-scenes evidence to support the theory. A Quiet Place stars John Krasinski and Emily Blunt as parents living in a silent apocalypse. If they or their children make a sound, the blind monsters that destroyed the world will hunt them down. The premise makes it seem a lot more like M. Night Shyamalan’s Signs or The Village than it does some kind of kaiju movie. But 10 Cloverfield Lane proved that just about any type of monster horror can fit the Cloverfield mold, especially when the events in The Cloverfield Paradox shattered reality across dimensions, causing giant monsters to appear in some dimensions and weird aliens in others. Emily Blunt plays a lead character opposite Krasinski in 'A Quiet Place'. The world of A Quiet Place might just be yet another dimension influenced by the Shepard particle accelerator that malfunctions in The Cloverfield Paradox. 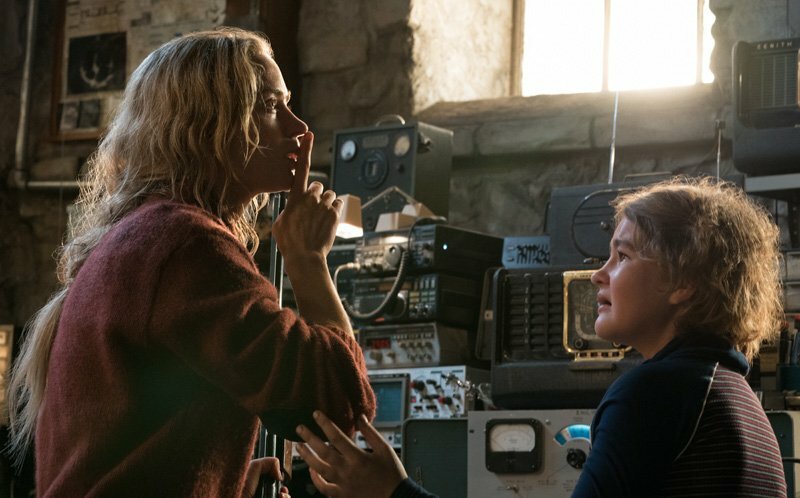 What if A Quiet Place is a low key Cloverfield 4? It might even make fans more excited to see what Jim from The Office is up to in the silent apocalypse. All of the Cloverfield movies thus far, including Paradox (before they sold it to Netflix, anyway), come from Paramount Pictures. Yes, Paramount is also the studio behind A Quiet Place. Interestingly, in April 2016 John Krasinski was originally attached to God Particle (which of course became The Cloverfield Paradox) in the role that went to Chris O’Dowd. Is it possible that J.J. Abrams secretly maneuvered Krasinski towards A Quiet Place instead to build that corner of the Cloverfield multiverse? By now, fans are onto the fact that every time Bad Robot buys the rights to a script, it becomes a Cloverfield movie. That’s what happened with both 10 Cloverfield Lane and The Cloverfield Paradox. That didn’t happen at all with A Quiet Place, but wouldn’t that make for the perfect cover story? We’ll have to wait for A Quiet Place to premiere at SXSW on March 9 before we hear more about its place in the universe. A Quiet Place opens for wide release in theaters on April 6, 2018.